I feel like I went through a phase in 2014 where I wasn't wearing my ModCloth finds enough. Now fast forward to early 2015 and I'm not only already on my second ModCloth round-up of the year but I'm a solid part into compiling a third "Brady Bunch" of 9 photos of outfits from ModCloth. I guess this big retailer is becoming my MVP in my closet in 2015! I love, love, love, LOVE raincoats. 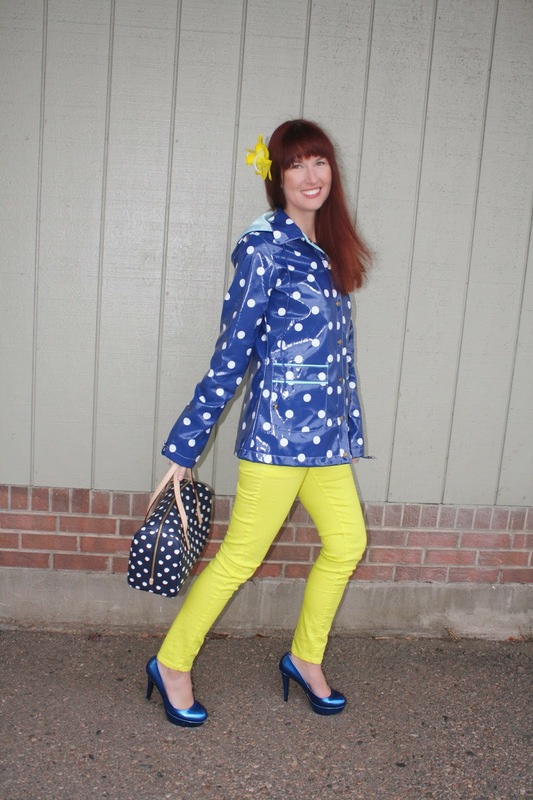 I'm not a fan of rain, but the fashion that goes along with it is quite fun indeed! This was taken on a day where it was starting to flurry but wasn't necessarily "winter jacket cold" so I got to break out this amazing jacket I got on discount from ModCloth over the summer. (Is it just me, or does anyone else feel like they're due for a HUGE sale again sooner than later...?) On this particular day it was also windy so I wore pants (skirts and dresses are a little annoying on windy days, at least to me). I'm a big fan of wearing bright colors to brighten your day, so these neon yellow bad boys were perfect for an overcast day! The rest I kept simple with color blocking and polka dots! This dress never gets a ton of love on Instagram, but I stand by it! I think it looks better in person than it photographs. Sometimes wearing a maxi dress is exactly what the doctor ordered. I wore this on a night out when it was a warmer day but the temperature was dropping at night. 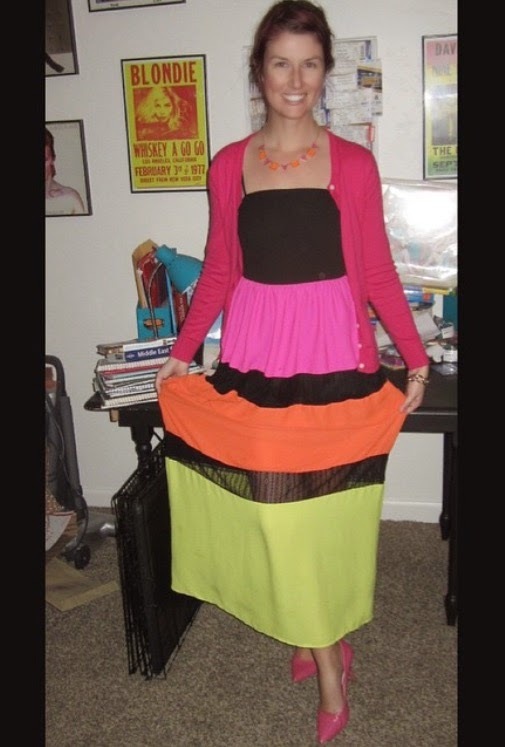 The length covered my legs, I added a cardigan, I was completely comfortable, and kept my style with bright colors and heels. I got complimented a lot on this night, probably because it's a simple outfit but it was tied together with corresponding heels, necklaces, and a cardigan color wise. I'm a big proponent that looking great doesn't have to be overly complicated or even overly fancy as much as just tying together a color or two to give your look a more polished feel! I wrote about this lovely skirt here! 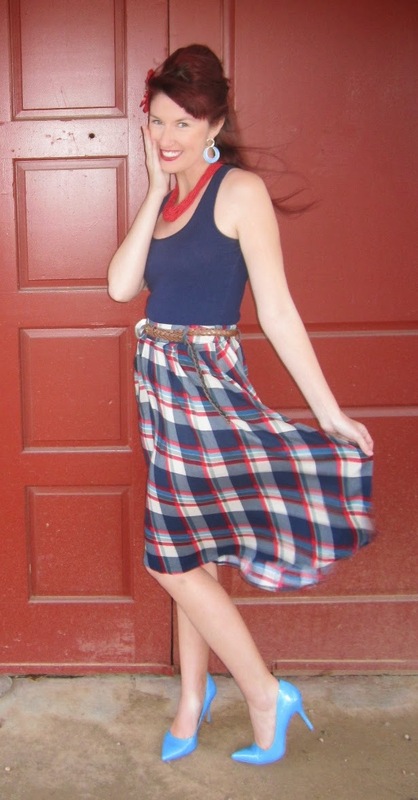 I really love this skirt, outfit, and the fact that for once the wind was actually working in my favor during a photo shoot!! Wow! Another pants picture in the same round-up! And this time the pants are from ModCloth! I'm a sucker for pants with the square pockets on the front and had wanted to try a high waisted version of this look. I was nervous because as I wrote about here, buying pants online is another animal than buying dresses. But these fit really well and they have become a bit of a staple-though not always photographed. (Running a quick errand when it's cold, going to a friend's house to watch TV, and even on one nicer evening out and about that just never found it's way in front of a camera). I tucked this sweater in to give it the full on 70s feel and paired it with different color accessories based on the colors in the sweater. The pants run slightly long so wearing a heeled boot felt very necessary-as I don't wish for these to fringe and fray at the bottom. I have a whole pictorial spread here from this bathing suit. But I want to talk about this suit in more detail now! I got this Esther Williams number over Black Friday and was kind of worried about it. Full disclosure: this is a size 4. My first foray into EW swimsuits led me to a size 6. It fit, but I felt like the bottom bunched up in an unflattering way, so I returned it. I (supposedly) made peace with the fact that EW suits maybe just didn't fit my body type and moved on. Then I kept seeing girls in all shapes and sizes look so amazing in them on ModCloth's Style Gallery so I started thinking again. I reasoned that I could maybe try Esther Williams again, but go smaller in hopes that there would be less fabric on the bottom, therefore less bunching. After reading several reviews I was still confused if my idea would work as girls raved and rants about both sizes and with my exact measurements. Knowing I wouldn't find a better deal than on Black Friday I bit the bullet and bought a size 4. My reasoning worked as it did fit better! I guess it just goes to show that no two bodies are built alike, regardless of what the numbers on the measuring tape says! I hope this anecdote if helpful for you if you find yourself between two sizes in terms of thinking around just measurements! Another full disclosure though, this suit does run tight! The fit itself doesn't (I own a few other EW suits now in a size 4 so I know this to be true), but the spandex is less forgiving while pulling it up past your knees and hips. Other EW suits are tricky like this, but this one takes the cake! Another vacation photo from Florida! I talked about how the straps busting on this dress turned out to be the happiest of accidents here. St. Patrick's Day was within a week away when I took this photo, so I was trying to wear green basically every day. I love this Bea and Dot skirt so much but somehow it gets neglected in my closet from time to time. I love that there's so many colors in the skirt so that I can basically have this be a new outfit each and every time. Obviously with it being St. Patrick's day I paired it with green, but opted to not go too match-y match-y by picking a complimentary gold purse instead of a green one. Another thing I love about this photo? I took it AFTER dinner! I love me some Day Light Saving's time as it makes getting outfit photos from what you wore that day that much easier! This was my night time outfit for actual St. Patrick's day! I was wearing a green sun dress during the day (that you can actually find at ModCloth but I didn't get it there so it's not included in this post) but the temperature began to drop so I decided to cover up a little bit more. 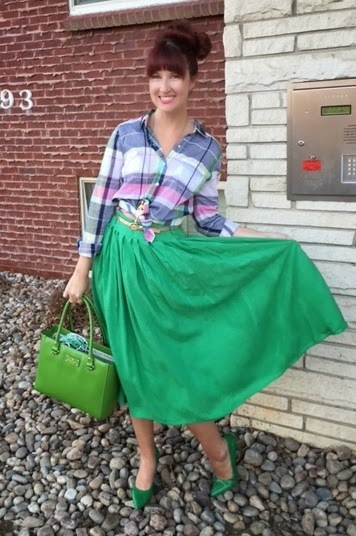 This is one of my favorite skirts, as well as one of my first ever ModCloth purchases! I have found this piece of clothing to be so versatile! As much as novelty prints will always be my favorite, every girl needs a skirt in a solid color that they love. Years ago when I was basically a jeans and tee shirt kind of girl St. Patrick's Day often meant jeans and a green top. Now that I'm a bit more diverse with my wardrobe it often means a green dress, or even a green skirt with a green accented shirt! Close-up of the pattern of the shirt, the belt, and this amazing vintage necklace! I wrote about this dress on my Gaga for Retrospec'd post and I had been jonesing to wear it again. The day I had to drive my brother to the airport after his trip out here was a) the day after St. Patrick's Day so I was ready to stop wearing green, and b) was kind of a gloomy day. Wearing black and gray felt fitting on an overcast day, but the print is so fun that it also served as a fun way to brighten the day too. I was excited to pair these gray Steve Madden wedges with the dress since I got the dress several months ago, but being in the dead of winter made that an impossible dream! Now that spring is here I was excited to finally do so! 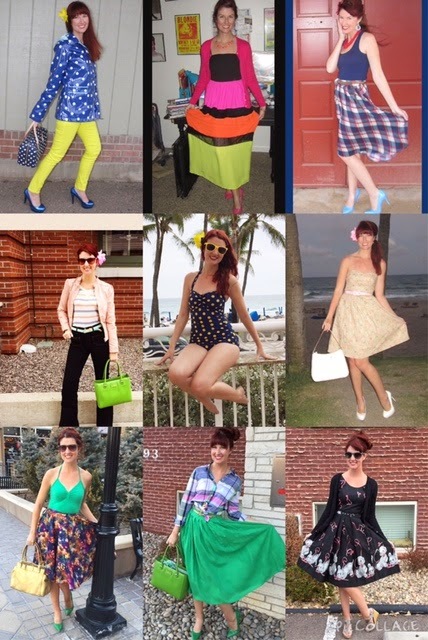 I love that Retrospec'd dress, they're one of my favorite vintage reproduction brands! Love all of these looks! Especially the Polka Dots! Modcloth is one of my favs - so obsessed with everything on that site! Hey, all! I'm a big baseball fan and my mom is from Chicago so I grew up hearing about the Cubs history and am pretty amped to be here at game 7! Anyone else into this year's World Series or have a fan favorite they're rooting for? Anyway, I just wanted to do a quick post showing my fandom! I decided to be silly and wear my Cubs tee with a skirt (same as my zombie skirt) from Retrolicious via ModCloth with bears all over them...get it? Hehe. I'm not into totally normal sports attire, as I exhibited HERE. Stay safe tonight if you're out watching tonight! Is this a style post only I could bring you or what? Not only did I mix prints (three times, as the Forever 21 shirt is gingham, the ModCloth briefcase is dinosaur printed, and my true vintage skirt is an ocean front border print!) but I'm mixing vintage with modern fashion. It seems that many vintage-y bloggers tend to stray from any trends, which is silly to me because these bomber jackets are SO comfortable and practical for between seasons weather (and frankly, Members Only IS a vintage brand)! I tied this whole look together with using the Members Only Satin Washed Boyfriend Jacket in burgundy with these platform heels from Amazon by Dadawen. I feel the burgundy bookends bounce off the greens and blues nicely. It was the best of times, and it was the worst of times. I generally hate cliche quotes that can easily be slapped on memes or on the coffee mug of a basic b!tch, but I'm hard pressed to find a better phrase to describe my life currently. In short: I've been having the most fun that I've ever had in the eight months since I moved to LA, but then the emergency breaks got slammed on my life when my mother fell gravely ill and passed away two weeks later on June 6th. I'm currently back in LA, after being gone for three weeks. I'm looking forward to continuing my comedy journey, as I feel it will save me from myself at this time. But while I'm functioning okay as I'm still in a great deal of shock and my current mode is auto pilot, certain hours of the day prove to me that I'm very jumbled up and confused about my mom's passing. I suddenly don't know what I'm in for and I don't know what I'm doing. I'm Lauren-Blair, but I often go by Blair. 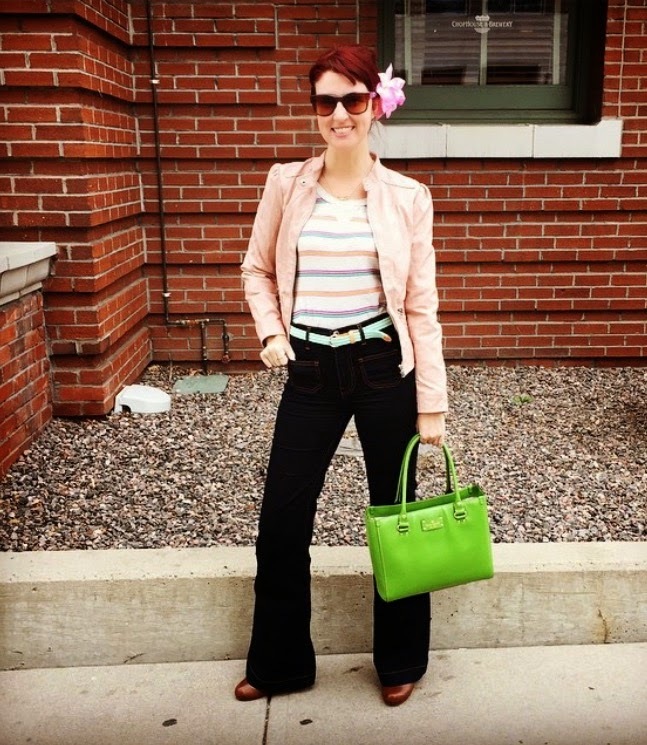 I live in Denver, CO.
A Fashion Blogger's Best Friend: Sunglasses!